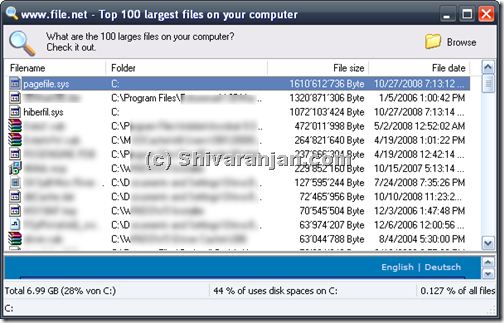 Largest File Finder is a free utility that scans all the drives present in the computer to find out the 100 large files present in the computer in descending order. The amazing feature of this software is that it scans all the drives pretty quick and the top 100 largest files is displayed. This is useful because I can run this tool periodically may be once a week and decide what are the large files that are lying in my drive and then decide the further course of action for those files. In this way I can reduce my disk clutter. The following information is provided about the 100 largest files: file name, full folder path, file size and date of last change. Also this utility does not require any installation hence can be run directly from a portable drive. We tested this in Windows XP and it worked in fine. In Windows Vista this program crashed twice and then finally this got launched the interface was broken but it did manage to work hence we don’t recommend this in Windows Vista environment. with the help of long path tool you can find and you can move and delete these folder also.